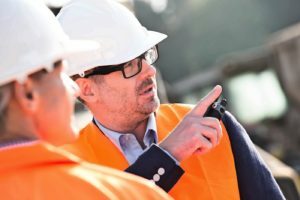 Who is responsible for asbestos management? Do you own or manage a non-domestic property or site? If so, you may be legally accountable for asbestos management in the premises and in most cases the first step in implementing a management plan is to commission an asbestos survey. Understanding who the duty holder is for premises is crucial if you are planning to undertake any work that may disturb Asbestos Containing Materials (ACMs). At Franks Portlock we like to ensure our clients have a full understanding of asbestos management, from the legal requirements of duty holders to what types of premises are affected. Below, you will find a step by step guide to the legality of asbestos surveys, learn who the duty holder is at your premises and how to ensure the responsibilities for asbestos management are met. If the owner has sole responsibility for the premises, or the common part of multi-occupied buildings. The duty of management will fall to the owner. If tenants (including employers or occupiers) are listed as responsible for alterations, repairs and maintenance under a tenancy agreement or contract, the tenant or tenants in multi-occupancy premises are responsible. If there is no tenancy agreement or contract, or the premises are unoccupied, the person in control of the premises is responsible. It is important to remember that the extent of this duty will depend on the nature of the agreement and should be clarified as soon as possible. What is the legal requirement / duty of responsibility? Presume all materials contain asbestos unless there is strong evidence that they do not. Find out if there are ACMs in the premises, detailing (if detected) the amount, where it is and what condition it is in. It is highly important that this is kept up to date, and the risk of anyone being exposed to asbestos fibres is assessed. Prepare a detailed plan that sets out how the risks from ACMs will be managed and take the necessary steps to put the plan into action. Periodically review and monitor the plan to ensure it is relevant and up-to-date. Provide information on the location and condition of ACMs to anyone who is liable to work on or disturb them. It is important to note that even if you are not the duty holder, you are required to co-operate as far as is necessary to allow the duty holder to comply with the above requirements. What types of premises are affected? A house converted into flats, occupied by more than one family would require the duty holder to be responsible for common parts such as access, storage, roof space etc, but not for the private rooms. Flats over a shop, with or without separate entrances would require the duty holder to take responsibility for the common areas, but not the private rooms if leased separate to the shop owner. As part of an asbestos management plan a survey should be carried out to locate asbestos in your premises. If you find asbestos, it will need to be safely managed. As the duty holder you are accountable for maintaining the safety of the building and should seek the services of a consultant who will be able to assist with an asbestos management strategy. Asbestos can often be safely labelled and managed, or made safe by repairing, encapsulating, or over-boarding. Complete removal may be required, but is not always the best option according to the HSE. At Franks Portlock we can advise and help specify a programme of remediation work to be carried out by a licensed asbestos removal operative. ACMs that remain should be periodically reinspected to check their condition hasn’t deteriorated, or they have become vulnerable to damage. However, if you discover undocumented materials which you believe might contain asbestos, the HSE advises that activity or work in the area stopped immediately, and a fully UKAS accredited and qualified professional is commissioned to conduct a thorough inspection. 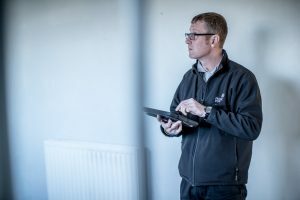 As a qualified and accredited asbestos consultant, we offer asbestos surveys for every eventuality and can also carry out air testing and clearance certification.